As a follow up to my previous post Simplicity is Divine, I wanted to quickly touch on how truly difficult it is to develop the simplicity that Google, Apple, and Intuit have achieved. Rumor has it that Google’s founders were so consumed with writing code that they created just enough HTML to get queries to their magical back end code. And that’s the way things have remained. The only way a Google feature, such as Google image search, can reside on the homepage is if it can generate a million page views per day. As for Apple, they have been touting simplicity for as long as I can remember (if you’re curious as to how long that is, I was born in the Year of the Dragon and am neither 6 nor 18 years old). Just visit Apple’s Switch site and you’ll see ‘ease of use’ infused in every image, sentence, and bullet. And Intuit went as far as hiring an editor from People magazine to translate accounting terms into everyday terms that users could understand. Add the fact that a consumer wants to feel that they’ve received what they’ve paid for, and it’s easy to see that the balance between simplicity and cool/extra features is delicate. Take for example BMW’s iDrive system. BMW introduced this technological marvel in 2001 and immediately received a swift kick in the pants as the automotive press and long time BMW aficionados complained about how difficult the system was to use. 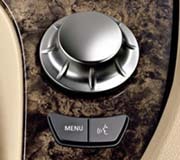 The iDrive is a single knob that allows the driver access to everything from the AC controls to the Navigation functions. Imagine walking up to your computer to find that the keyboard and mouse have been replaced with a single knob? Well this is an exaggeration of what BMW did with the iDrive, and consumers have hated it ever since. So if you ever do set out to simplify your product, process flow, operations, business, et cetera, take a tip from those who have been able to find simplicity in providing just enough. See this site for more information about Apple.